Feel free to use the Gitter community gitter.im/scattertext for help or to discuss the project. Jason S. Kessler. 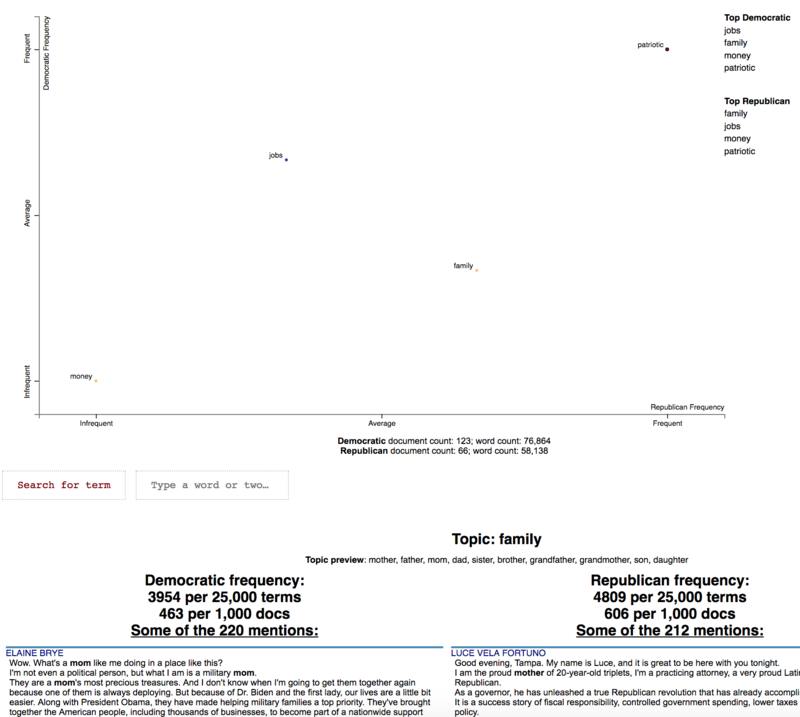 Scattertext: a Browser-Based Tool for Visualizing how Corpora Differ. ACL System Demonstrations. 2017. If you cannot (or don't want to) install spaCy, substitute nlp = spacy.en.English() lines with nlp = scattertext.WhitespaceNLP.whitespace_nlp. Note, this is not compatible with word_similarity_explorer, and the tokenization and sentence boundary detection capabilities will be low-performance regular expressions. See demo_without_spacy.py for an example. It is recommended you install jieba, spacy, empath, astropy, gensim and umap-learn in order to take full advantage of Scattertext. Scattertext should mostly work with Python 2.7. The HTML outputs look best in Chrome and Safari. Added the following classes to support rank-based feature-selection: AssociationCompactorByRank, TermCategoryRanker. Merged PR from @millengustavo to fix when a FutureWarning is issued every time the get_background_frequency_df is called. Added ScatterChart.hide_terms(terms: iter[str]) which enables selected terms to be hidden from the chart. Added ScatterChartData.score_transform to specify the function which can change an original score into a value between 0 and 1 used for term coloring. Added alternative_term_func to produce_scattertext_explorer which allows you to inject a function that activates when a term is clicked. Fixed Cohen's d calculation, and added HedgesR, and unbiased version of Cohen's d which is a subclass of CohensD. Added the frequency_transform parameter to produce_frequency_explorer. This defaults to a log transform, but allows you to use any way your heart desires to order terms along the x-axis. Added show_category_headings=True to produce_scattertext_explorer. Setting this to False suppresses the list of categories which will be displayed in the term context area. Added show_cross_axes=True to produce_scattertext_explorer. Setting this to False prevents the cross axes from being displayed if show_axes is True. Changed default scorer to RankDifference. Made sure that term contexts were properly shown in all configurations. TermDocMatrix.get_metadata_freq_df now accepts the label_append argument which by default adds ' freq' to the end of each column. TermDocMatrix.get_num_cateogires returns the number of categories in a term-document matrix. unified_context argument in produce_scattertext_explorer lists all contexts in a single column. This let's you see snippets organized by multiple categories in a single column. See demo_unified_context.py for an example. helps category-free or multi-category analyses. In 0.0.2.32 we added a series of objects to handle uncategorized corpora. Added section on Document-Based Scatterplots, and the add_doc_names_as_metadata function. CategoryColorAssigner was also added to assign colors to a qualitative categories. The name of this project is Scattertext. "Scattertext" is written as a single word and should be capitalized. When used in Python, the package scattertext should be defined to the name st, i.e., import scattertext as st. This is a tool that's intended for visualizing what words and phrases are more characteristic of a category than others. Consider the example at the top of the page. Looking at this seem overwhelming. In fact, it's a relatively simple visualization of word use during the 2012 political convention. Each dot corresponds to a word or phrase mentioned by Republicans or Democrats during their conventions. The closer a dot is to the top of the plot, the more frequently it was used by Democrats. The further right a dot, the more that word or phrase was used by Republicans. Words frequently used by both parties, like "of" and "the" and even "Mitt" tend to occur in the upper-right-hand corner. Although very low frequency words have been hidden to preserve computing resources, a word that neither party used, like "giraffe" would be in the bottom-left-hand corner. The interesting things happen close to the upper-left and lower-right corners. In the upper-left corner, words like "auto" (as in auto bailout) and "millionaires" are frequently used by Democrats but infrequently or never used by Republicans. Likewise, terms frequently used by Republicans and infrequently by Democrats occupy the bottom-right corner. These include "big government" and "olympics", referring to the Salt Lake City Olympics in which Gov. Romney was involved. Terms are colored by their association. Those that are more associated with Democrats are blue, and those more associated with Republicans red. Terms (only unigrams for now) that are most characteristic of the both sets of documents are displayed on the far-right of the visualization. The inspiration for this visualization came from Dataclysm (Rudder, 2014). Scattertext is designed to help you build these graphs and efficiently label points on them. The documentation (including this readme) is a work in progress. Please see the tutorial below as well as the PyData 2017 Tutorial. Poking around the code and tests should give you a good idea of how things work. 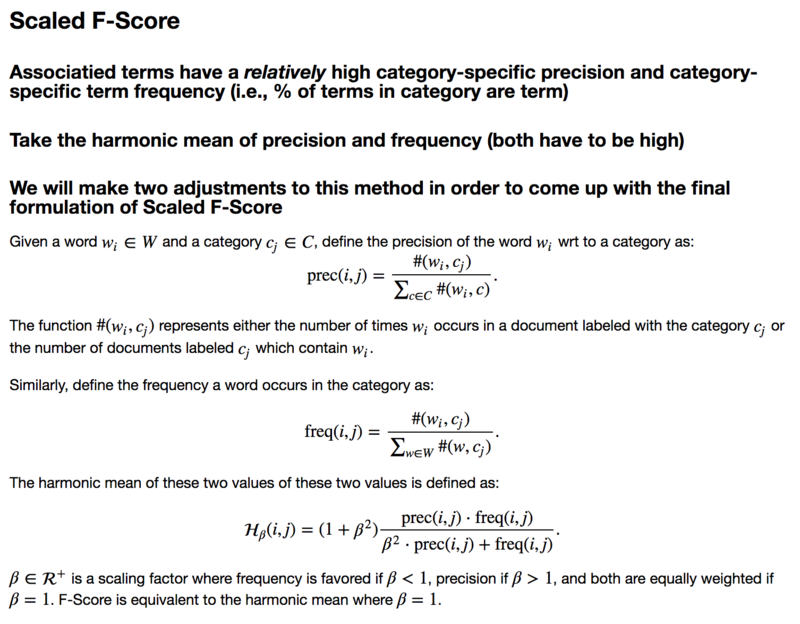 The library covers some novel and effective term-importance formulas, including Scaled F-Score. Help! I don't know Python but I still want to use Scattertext. While you should learn Python fully use Scattertext, I've put some of the basic functionality in a commandline tool. The tool is installed when you follow the procedure layed out above. Run $ scattertext --help from the commandline to see the full usage information. Here's a quick example of how to use vanilla Scattertext on a CSV file. The file needs to have at least two columns, one containing the text to be analyzed, and another containing the category. In the example CSV below, the columns are text and party, respectively. The example below processes the CSV file, and the resulting HTML visualization into cli_demo.html. Note, the parameter --minimum_term_frequency=8 omit terms that occur less than 8 times, and --regex_parser indicates a simple regular expression parser should be used in place of spaCy. The flag --one_use_per_doc indicates that term frequency should be calculated by only counting no more than one occurrence of a term in a document. If you'd like to parse non-English text, you can use the --spacy_language_model argument to configure which spaCy language model the tool will use. The default is 'en' and you can see the others available at https://spacy.io/docs/api/language-models. democrat,BARACK OBAMA,"Thank you. Thank you. Thank you. Thank you so much.Thank you.Thank you so much. Thank you. Thank you very much, everybody. Thank you. The following code creates a stand-alone HTML file that analyzes words used by Democrats and Republicans in the 2012 party conventions, and outputs some notable term associations. First, import Scattertext and spaCy. Next, assemble the data you want to analyze into a Pandas data frame. It should have at least two columns, the text you'd like to analyze, and the category you'd like to study. Here, the text column contains convention speeches while the party column contains the party of the speaker. We'll eventually use the speaker column to label snippets in the visualization. Turn the data frame into a Scattertext Corpus to begin analyzing it. To look for differences in parties, set the category_col parameter to 'party', and use the speeches, present in the text column, as the texts to analyze by setting the text col parameter. Finally, pass a spaCy model in to the nlp argument and call build() to construct the corpus. Let's see characteristic terms in the corpus, and terms that are most associated Democrats and Republicans. See slides 52 to 59 of the Turning Unstructured Content ot Kernels of Ideas talk for more details on these approaches. Here are the terms that differentiate the corpus from a general English corpus. Now, let's write the scatter plot a stand-alone HTML file. We'll make the y-axis category "democrat", and name the category "Democrat" with a capital "D" for presentation purposes. We'll name the other category "Republican" with a capital "R". All documents in the corpus without the category "democrat" will be considered Republican. We set the width of the visualization in pixels, and label each excerpt with the speaker using the metadata parameter. Finally, we write the visualization to an HTML file. Below is what the webpage looks like. Click it and wait a few minutes for the interactive version. In order to visualize Empath (Fast 2016) topics and categories instead of terms, we'll need to create a Corpus of extracted topics and categories rather than unigrams and bigrams. To do so, use the FeatsOnlyFromEmpath feature extractor. See the source code for examples of how to make your own. When creating the visualization, pass the use_non_text_features=True argument into produce_scattertext_explorer. This will instruct it to use the labeled Empath topics and categories instead of looking for terms. Since the documents returned when a topic or category label is clicked will be in order of the document-level category-association strength, setting use_full_doc=True makes sense, unless you have enormous documents. Otherwise, the first 300 characters will be shown. (New in 0.0.26). Ensure you include topic_model_term_lists=feat_builder.get_top_model_term_lists() in produce_scattertext_explorer to ensure it bolds passages of snippets that match the topic model. Scattertext also includes a feature builder to explore the relationship between General Inquirer Tag Categoires and Document Categories. We'll use a slightly different approach, looking at relationship of GI Tag Categories to political parties by using the Z-Scores of the Log-Odds-Ratio with Uninformative Dirichlet Priors (Monroe 2008). We'll use the produce_frequency_explorer plot variation to visualize this relationship, setting the x-axis as the number of times a word in the tag category occurs, and the y-axis as the z-score. For more information on the General Inquirer, please see the General Inquirer Home Page. We'll use the same data set as before, except we'll use the FeatsFromGeneralInquirer feature builder. Next, we'll call produce_frequency_explorer in a similar way we called produce_scattertext_explorer in the previous section. There are a few differences, however. First, we specify the LogOddsRatioUninformativeDirichletPrior term scorer, which scores the relationships between the categories. The grey_threshold indicates the points scoring between [-1.96, 1.96] (i.e., p > 0.05) should be colored gray. The argument metadata_descriptions=general_inquirer_feature_builder.get_definitions() indicates that a dictionary mapping the tag name to a string definition is passed. When a tag is clicked, the definition in the dictionary will be shown below the plot, as shown in the image following the snippet. Often the terms of most interest are ones that are characteristic to the corpus as a whole. These are terms which occur frequently in all sets of documents being studied, but relatively infrequent compared to general term frequencies. We can produce a plot with a characteristic score on the x-axis and class-association scores on the y-axis using the function produce_characteristic_explorer. Corpus characteristicness is the difference in dense term ranks between the words in all of the documents in the study and a general English-language frequency list. See this Talk on Term-Class Association Scores for a more thorough explanation. Next, let's add the document names as meta data in the corpus object. The add_doc_names_as_metadata function takes an array of document names, and populates a new corpus' meta data with those names. If two documents have the same name, it appends a number (starting with 1) to the name. Next, we find tf.idf scores for the corpus' term-document matrix, run sparse SVD, and add them to a projection data frame, making the x and y-axes the first two singular values, and indexing it on the corpus' meta data, which corresponds to the document names. Finally, set scores as 1 for Democrats and 0 for Republicans, rendering Republican documents as red points and Democratic documents as blue. For more on the produce_pca_explorer function, see Using SVD to visualize any kind of word embeddings. Using Cohen's d or Hedge's r to visualize effect size. Cohen's d is a popular metric used to measure effect size. The definitions of Cohen's d and Hedge's r from (Shinichi and Cuthill 2017) are implemented in Scattertext. We can create a term scorer object to examine the effect sizes and other metrics. Our calculation of Cohen's d is not directly based on term counts. Rather, we divide each document's term counts by the total number of terms in the document before calculating the statistics. m1 and m2 are, respectively the mean portions of words in speeches made by Democrats and Republicans that were the term in question. The effect size (cohens_d) is the difference between these means divided by the pooled standard standard deviation. cohens_d_se is the standard error of the statistic, while cohens_d_z and cohens_d_p are the Z-scores and p-values indicating the statistical significance of the effect. Corresponding columns are present for Hedge's r, and unbiased version of Cohen's d.
Let's now turn our attention to a novel term scoring metric, Scaled F-Score. We'll examine this on a unigram version of the Rotten Tomatoes corpus (Pang et al. 2002). It contains excerpts of positive and negative movie reviews. Please see Scaled F Score Explanation for a notebook version of this analysis. term_freq_df['pos_freq_pct'] = (term_freq_df['Positive freq'] * 1. If we plot term frequency on the x-axis and the percentage of a term's occurrences which are in positive documents (i.e., its precision) on the y-axis, we can see that low-frequency terms have a much higher variation in the precision. Given these terms have low frequencies, the harmonic means are low. Thus, the only terms which have a high harmonic mean are extremely frequent words which tend to all have near average precisions. term_freq_df['neg_freq_pct_normcdf'] = normcdf((term_freq_df['Negative freq'] * 1. We can use st.ScaledFScorePresets as a term scorer to display terms' Scaled F-Score on the y-axis and term frequencies on the x-axis. 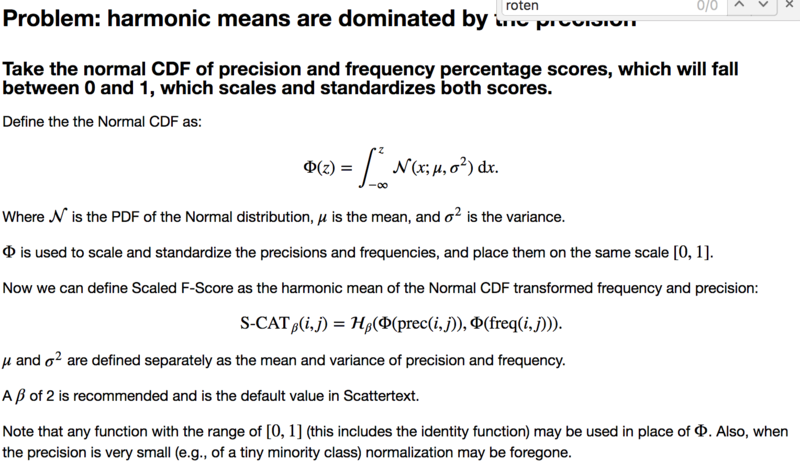 Scaled F-Score is not the only scoring method included in Scattertext. Please click on one of the links below to view a notebook which describes how other class association scores work and can be visualized through Scattertext. Occasionally, only term frequency statistics are available. This may happen in the case of very large, lost, or proprietary data sets. TermCategoryFrequencies is a corpus representation,that can accept this sort of data, along with any categorized documents that happen to be available. Let use the Corpus of Contemporary American English as an example. We'll construct a visualization to analyze the difference between spoken American English and English that occurs in fiction. Transforming this into a visualization is extremely easy. Just pass a dataframe indexed on terms with columns indicating category-counts into the the TermCategoryFrequencies constructor. If you'd like to incorporate some documents into the visualization, you can add them into to the TermCategoyFrequencies object. First, let's extract some example Fiction and Spoken documents from the sample COCA corpus. And we'll pass the documents_df dataframe into TermCategoryFrequencies via the document_category_df parameter. Ensure the dataframe has two columns, 'text' and 'category'. Afterward, we can call produce_scattertext_explorer (or your visualization function of choice) normally. 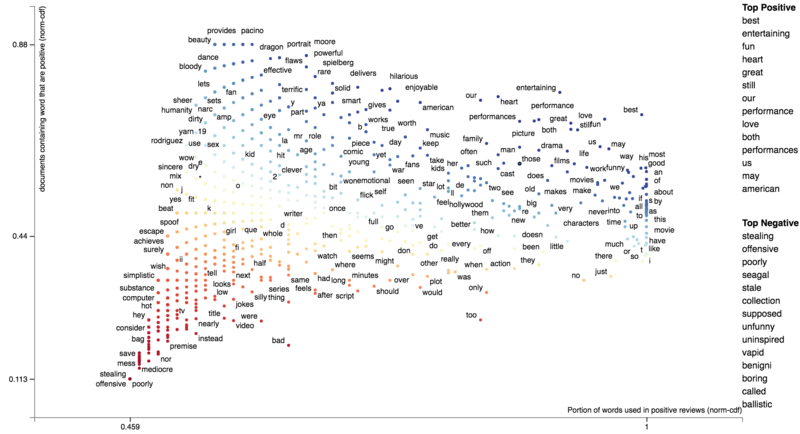 Word representations have recently become a hot topic in NLP. While lots of work has been done visualizing how terms relate to one another given their scores (e.g., http://projector.tensorflow.org/), none to my knowledge has been done visualizing how we can use these to examine how document categories differ. In this example given a query term, "jobs", we can see how Republicans and Democrats talk about it differently. In this configuration of Scattertext, words are colored by their similarity to a query phrase. This is done using spaCy-provided GloVe word vectors (trained on the Common Crawl corpus). The cosine distance between vectors is used, with mean vectors used for phrases. The calculation of the most similar terms associated with each category is a simple heuristic. First, sets of terms closely associated with a category are found. 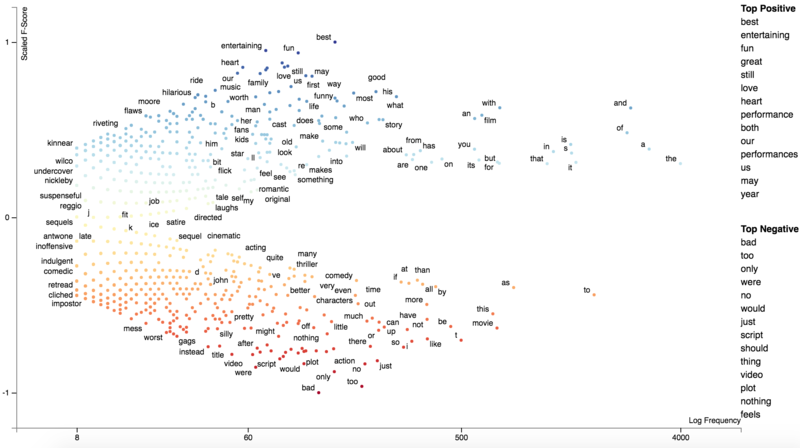 Second, these terms are ranked based on their similarity to the query, and the top rank terms are displayed to the right of the scatterplot. A term is considered associated if its p-value is less than 0.05. P-values are determined using Monroe et al. (2008)'s difference in the weighted log-odds-ratios with an uninformative Dirichlet prior. This is the only model-based method discussed in Monroe et al. that does not rely on a large, in-domain background corpus. Since we are scoring bigrams in addition to the unigrams scored by Monroe, the size of the corpus would have to be larger to have high enough bigram counts for proper penalization. This function relies the Dirichlet distribution's parameter alpha, a vector, which is uniformly set to 0.01. Here is the code to produce such a visualization. Scattertext can interface with Gensim Word2Vec models. For example, here's a snippet from demo_gensim_similarity.py which illustrates how to train and use a word2vec model on a corpus. Note the similarities produced reflect quirks of the corpus, e.g., "8" tends to refer to the 8% unemployment rate at the time of the convention. How Democrats and Republicans talked differently about "jobs" in their 2012 convention speeches. We can use Scattertext to visualize alternative types of word scores, and ensure that 0 scores are greyed out. Use the sparse_explroer function to acomplish this, and see its source code for more details. You can also use custom term positions and axis labels. For example, you can base terms' y-axis positions on a regression coefficient and their x-axis on term frequency and label the axes accordingly. The one catch is that axis positions must be scaled between 0 and 1. First, let's define two scaling functions: scale to project positive values to [0,1], and zero_centered_scale project real values to [0,1], with negative values always <0.5, and positive values always >0.5. ...     return (ar + 1) / 2. Next, let's compute and scale term frequencies and L2-penalized regression coefficients. We'll hang on to the original coefficients and allow users to view them by mousing over terms. Finally, we can write the visualization. Note the use of the x_coords and y_coords parameters to store the respective coordinates, the scores and sort_by_dist arguments to register the original coefficients and use them to rank the terms in the right-hand list, and the x_label and y_label arguments to label axes. The Emoji analysis capability displays a chart of the category-specific distribution of Emoji. Let's look at a new corpus, a set of tweets. We'll build a visualization showing how men and women use emoji differently. Note: the following example is implemented in demo_emoji.py. First, we'll load the dataset and parse it using NLTK's tweet tokenizer. Note, install NLTK before running this example. It will take some time for the dataset to download. Next, we'll use the AgeFromName package to find the probabilities of the gender of each user given their first name. First, we'll find a dataframe indexed on first names that contains the probability that each someone with that first name is male (male_prob). Next, we'll extract the first names of each user, and use the male_prob data frame to find users whose names indicate there is at least a 90% chance they are either male or female, label those users, and create new data frame df_mf with only those users. The key to this analysis is to construct a corpus using only the emoji extractor st.FeatsFromSpacyDocOnlyEmoji which builds a corpus only from emoji and not from anything else. Next, we'll run this through a standard produce_scattertext_explorer visualization generation. Suppose you'd like to audit or better understand weights or importances given to bag-of-words features by a classifier. 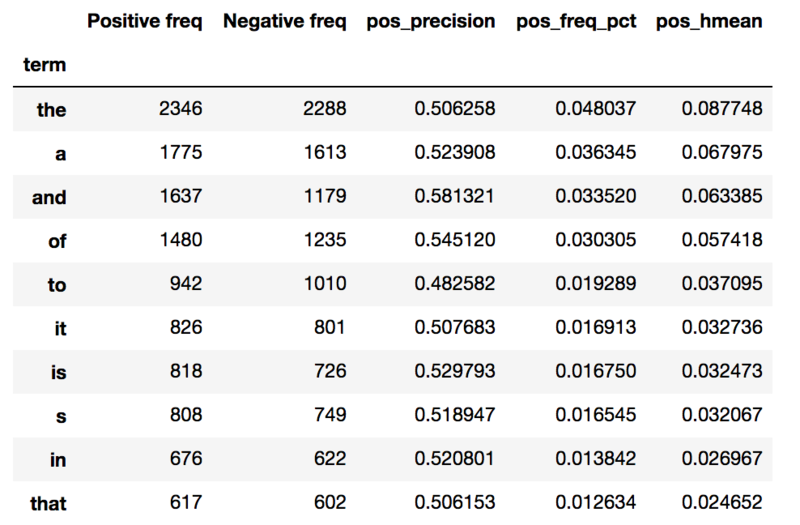 It's easy to use Scattertext to do, if you use a Scikit-learn-style classifier. For example the Lighting package makes available high-performance linear classifiers which are have Scikit-compatible interfaces. First, let's import sklearn's text feature extraction classes, the 20 Newsgroup corpus, Lightning's Primal Coordinate Descent classifier, and Scattertext. We'll also fetch the training portion of the Newsgroup corpus. Next, we'll tokenize our corpus twice. Once into tfidf features which will be used to train the classifier, an another time into ngram counts that will be used by Scattertext. It's important that both vectorizers share the same vocabulary, since we'll need to apply the weight vector from the model onto our Scattertext Corpus. Next, we use the CorpusFromScikit factory to build a Scattertext Corpus object. Ensure the X parameter is a document-by-feature matrix. The argument to the y parameter is an array of class labels. Each label is an integer representing a different news group. We the feature_vocabulary is the vocabulary used by the vectorizers. The category_names are a list of the 20 newsgroup names which as a class-label list. The raw_texts is a list of the text of newsgroup texts. Now, we can train the model on tfidf_X and the categoricla response variable, and capture feature weights for category 0 ("alt.atheism"). Finally, we can create a Scattertext plot. We'll use the Monroe-style visualization, and automatically select around 4000 terms that encompass the set of frequent terms, terms with high absolute scores, and terms that are characteristic of the corpus. Microaveraged F1 score 0.662108337759. Not bad over a ~0.05 baseline. Please see Signo for an introduction to semiotic squares. The idea behind the semiotic square is to express the relationship between two opposing concepts and concepts things within a larger domain of a discourse. Examples of opposed concepts life or death, male or female, or, in our example, positive or negative sentiment. Semiotics squares are comprised of four "corners": the upper two corners are the opposing concepts, while the bottom corners are the negation of the concepts. Circumscribing the negation of a concept involves finding everything in the domain of discourse that isn't associated with the concept. For example, in the life-death opposition, one can consider the universe of discourse to be all animate beings, real and hypothetical. The not-alive category will cover dead things, but also hypothetical entities like fictional characters or sentient AIs. In building lexicalized semiotic squares, we consider concepts to be documents labeled in a corpus. Documents, in this setting, can belong to one of three categories: two labels corresponding to the opposing concepts, a neutral category, indicating a document is in the same domain as the opposition, but cannot fall into one of opposing categories. In the example below positive and negative movie reviews are treated as the opposing categories, while plot descriptions of the same movies are treated as the neutral category. Terms associated with one of the two opposing categories (relative only to the other) are listed as being associated with that category. Terms associated with a netural category (e.g., not positive) are terms which are associated with the disjunction of the opposite category and the neutral category. For example, not-positive terms are those most associated with the set of negative reviews and plot descriptions vs. positive reviews. Common terms among adjacent corners of the square are also listed. An HTML-rendered square is accompanied by a scatter plot. Points on the plot are terms. The x-axis is the Z-score of the association to one of the opposed concepts. The y-axis is the Z-score how associated a term is with the neutral set of documents relative to the opposed set. A point's red-blue color indicate the term's opposed-association, while the more desaturated a term is, the more it is associated with the neutral set of documents. There are a number of other types of semiotic square construction functions. A frequently requested feature of Scattertext has been the ability to visualize topic models. While this capability has existed in some forms (e.g., the Empath visualization), I've finally gotten around to implementing a concise API for such a visualization. There are three main ways to visualize topic models using Scattertext. The first is the simplest: manually entering topic models and visualizing them. The second uses a Scikit-Learn pipeline to produce the topic models for visualization. The third is a novel topic modeling technique, based on finding terms similar to a custom set of seed terms. If you have already created a topic model, simply structure it as a dictionary. 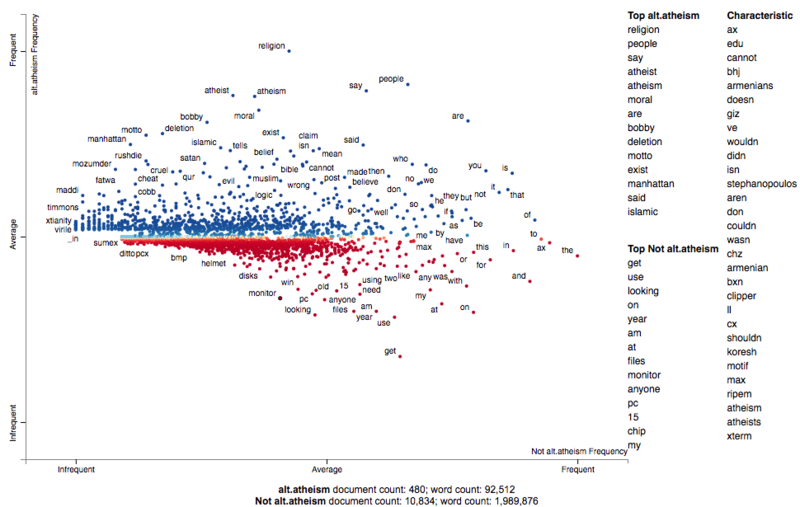 This dictionary is keyed on string which serve as topic titles and are displayed in the main scatterplot. The values are lists of words that belong to that topic. The words that are in each topic list are bolded when they appear in a snippet. Note that currently, there is no support for keyword scores. We can use the FeatsFromTopicModel class to transform this topic model into one which can be visualized using Scattertext. This is used just like any other feature builder, and we pass the topic model object into produce_scattertext_explorer. Since topic modeling using document-level coocurence generally produces poor results, I've added a SentencesForTopicModeling class which allows clusterting by coocurence at the sentence-level. It requires a ParsedCorpus object to be passed to its constructor, and creates a term-sentence matrix internally. Next, you can create a topic model dictionary like the one above by passing in a Scikit-Learn clustering or dimensionality reduction pipeline. The only constraint is the last transformer in the pipeline must populate a components_ attribute. The num_topics_per_term attribute specifies how many terms should be added to a list. In the following example, we'll use NMF to cluster a stoplisted, unigram corpus of documents, and use the topic model dictionary to create a FeatsFromTopicModel, just like before. Note that in produce_scattertext_explorer, we make the topic_model_preview_size 20 in order to show a preview of the first 20 terms in the topic in the snippet view as opposed to the default 10. A surprisingly easy way to generate good topic models is to use a term scoring formula to find words that are associated with sentences where a seed word occurs vs. where one doesn't occur. Given a custom term list, the SentencesForTopicModeling.get_topics_from_terms will generate a series of topics. Note that the dense rank difference (RankDifference) works particularly well for this task, and is the default parameter. # for the complete example. Scattertext makes it easy to create word-similarity plots using projections of word embeddings as the x and y-axes. In the example below, we create a stop-listed Corpus with only unigram terms. The produce_projection_explorer function by uses Gensim to create word embeddings and then projects them to two dimentions using Uniform Manifold Approximation and Projection (UMAP). UMAP is chosen over T-SNE because it can employ the cosine similarity between two word vectors instead of just the euclidean distance. In order to use custom word embedding functions or projection functions, pass models into the word2vec_model and projection_model parameters. In order to use T-SNE, for example, use projection_model=sklearn.manifold.TSNE(). Term positions can also be determined by the positions of terms according to the output of principal component analysis, and produce_projection_explorer also supports this functionality. We'll look at how axes transformations ("scalers" in Scattertext terminology) can make it easier to inspect the output of PCA. We'll use the 2012 Conventions corpus for these visualizations. Only unigrams occurring in at least three documents will be considered. Next, we use scikit-learn's tf-idf transformer to find very simple, sparse embeddings for all of these words. Since, we input a #docs x #terms matrix to the transformer, we can transpose it to get a proper term-embeddings matrix, where each row corresponds to a term, and the columns correspond to document-specific tf-idf scores. Given these spare embeddings, we can apply sparse singular value decomposition to extract three factors. SVD outputs factorizes the term embeddings matrix into three matrices, U, Σ, and VT. Importantly, the matrix U provides the singular values for each term, and VT provides them for each document, and Σ is a vector of the singular values. We'll look at the first two singular values, plotting each term such that the x-axis position is the first singular value, and the y-axis term is the second. To do this, we make a "projection" data frame, where the x and y columns store the first two singular values, and key the data frame on each term. This controls the term positions on the chart. We'll use the produce_pca_explorer function to visualize these. Note we include the projection object, and specify which singular values were used for x and y (x_dim and y_dim) so we they can be labeled in the interactive visualization. Click for an interactive visualization. We can easily re-scale the plot in order to make more efficient use of space. For example, passing in scaler=scale_neg_1_to_1_with_zero_mean will make all four quadrants take equal area. Please see the examples in the PyData 2017 Tutorial on Scattertext. Cozy: The Collection Synthesizer (Loncaric 2016) was used to help determine which terms could be labeled without overlapping a circle or another label. It automatically built a data structure to efficiently store and query the locations of each circle and labeled term. A number of new term scoring approaches including RelativeEntropy (a direct implementation of Frankhauser et al. (2014)), and ZScores and implementation of the Z-Score model used in Frankhauser et al. TermDocMatrix.get_metadata_freq_df() returns a metadata-doc corpus. CorpusBasedTermScorer.set_ranker allows you to use a different term ranker when finding corpus-based scores. This not only lets these scorers with metadata, but also allows you to integrate once-per-document counts. Fixed produce_projection_explorer such that it can work with a predefined set of term embeddings. This can allow, for example, the easy exploration of one hot-encoded term embeddings in addition to arbitrary lower-dimensional embeddings. Added add_metadata to TermDocMatrix in order to inject meta data after a TermDocMatrix object has been created. Made sure tooltip never started above the top of the web page. Fixed bug #31, enabling context to show when metadata value is clicked. Enabled display of terms in topic models in explorer, along with the the display of customized topic models. Please see Visualizing topic models for an overview of the additions. Now compatible with Gensim 3.4.0. 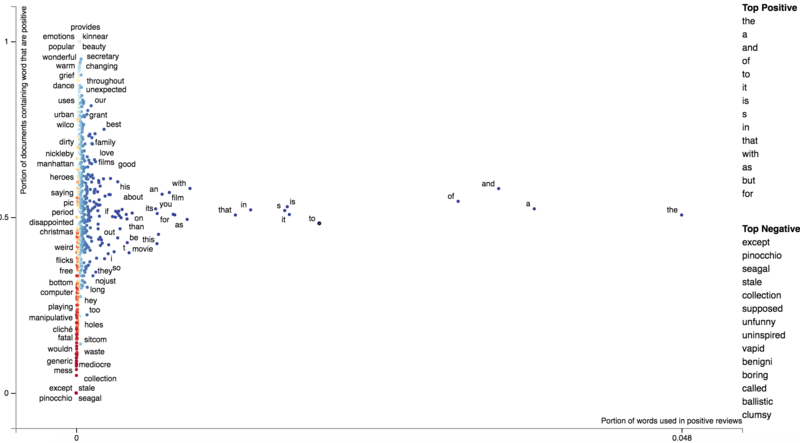 Added characteristic explorer, produce_characteristic_explorer, to plot terms with their characteristic scores on the x-axis and their class-association scores on the y-axis. See Ordering Terms by Corpus Characteristicness for more details. Added TermCategoryFrequencies in response to Issue 23. Please see Visualizing differences based on only term frequencies for more details. Added x_axis_labels and y_axis_labels parameters to produce_scattertext_explorer. These let you include evenly-spaced string axis labels on the chart, as opposed to just "Low", "Medium" and "High". These rely on d3's ticks function, which can behave unpredictable. Caveat usor. Semiotic Squares now look better, and have customizable labels. Incorporated the General Inquirer lexicon. For non-commercial use only. The lexicon is downloaded from their homepage at the start of each use. See demo_general_inquierer.py. Incorporated Phrasemachine from AbeHandler (Handler et al. 2016). For the license, please see PhraseMachineLicense.txt. For an example, please see demo_phrase_machine.py. Added CompactTerms for removing redundant and infrequent terms from term document matrices. These occur if a word or phrase is always part of a larger phrase; the shorter phrase is considered redundant and removed from the corpus. See demo_phrase_machine.py for an example. Added FourSquare, a pattern that allows for the creation of a semiotic square with separate categories for each corner. Please see demo_four_square.py for an early example. Finally, added a way to easily perform T-SNE-style visualizations on a categorized corpus. This uses, by default, the umap-learn package. Please see demo_tsne_style.py. Fixed to ScaledFScorePresets(one_to_neg_one=True), added UnigramsFromSpacyDoc. Now, when using CorpusFromPandas, a CorpusDF object is returned, instead of a Corpus object. This new type of object keeps a reference to the source data frame, and returns it via the CorpusDF.get_df() method. The factory CorpusFromFeatureDict was added. It allows you to directly specify term counts and metadata item counts within the dataframe. Please see test_corpusFromFeatureDict.py for an example. Added a very semiotic square creator. The idea to build a semiotic square that contrasts two categories in a Term Document Matrix while using other categories as neutral categories. See Creating semiotic squares for an overview on how to use this functionality and semiotic squares. Added a parameter to disable the display of the top-terms sidebar, e.g., produce_scattertext_explorer(..., show_top_terms=False, ...). An interface to part of the subjectivity/sentiment dataset from Bo Pang and Lillian Lee. ``A Sentimental Education: Sentiment Analysis Using Subjectivity Summarization Based on Minimum Cuts''. ACL. 2004. See SampleCorpora.RottenTomatoes. Fixed bug that caused tooltip placement to be off after scrolling. Made category_name and not_category_name optional in produce_scattertext_explorer etc. Integration with Scikit-Learn's text-analysis pipeline led the creation of the CorpusFromScikit and TermDocMatrixFromScikit classes. The AutoTermSelector class to automatically suggest terms to appear in the visualization. This can make it easier to show large data sets, and remove fiddling with the various minimum term frequency parameters. Also, I updated the library and examples to be compatible with spaCy 2. Fixed bug when processing single-word documents, and set the default beta to 2. Added produce_frequency_explorer function, and adding the PEP 369-compliant __version__ attribute as mentioned in #19. Fixed bug when creating visualizations with more than two possible categories. Now, by default, category names will not be title-cased in the visualization, but will retain their original case. If you'd still like to do this this, use ScatterChart (or a descendant).to_dict(..., title_case_names=True). Fixed DocsAndLabelsFromCorpus for Py 2 compatibility. Fixed bugs in chinese_nlp when jieba has already been imported and in p-value computation when performing log-odds-ratio w/ prior scoring. Added demo for performing a Monroe et. al (2008) style visualization of log-odds-ratio scores in demo_log_odds_ratio_prior.py. Breaking change: pmi_filter_thresold has been replaced with pmi_threshold_coefficient. Added Emoji and Tweet analysis. See Emoji analysis. Characteristic terms falls back ot "Most frequent" if no terms used in the chart are present in the background corpus. Fixed top-term calculation for custom scores. Set scaled f-score's default beta to 0.5. Added --spacy_language_model argument to the CLI. Added the alternative_text_field option in produce_scattertext_explorer to show an alternative text field when showing contexts in the interactive HTML visualization. Updated ParsedCorpus.get_unigram_corpus to allow for continued alternative_text_field functionality. Fixed a bug in corpus construction that occurs when the last document has no features. Now you don't have to install tinysegmenter to use Scattertext. But you need to install it if you want to parse Japanese. This caused a problem when Scattertext was being installed on Windows. Added TermDocMatrix.get_corner_score, giving an improved version of the Rudder Score. Exposing whitespace_nlp_with_sentences. It's a lightweight bad regex sentence splitter built a top a bad regex tokenizer that somewhat apes spaCy's API. Use it if you don't have spaCy and the English model downloaded or if you care more about memory footprint and speed than accuracy. It's not compatible with word_similarity_explorer but is compatible with `word_similarity_explorer_gensim'. 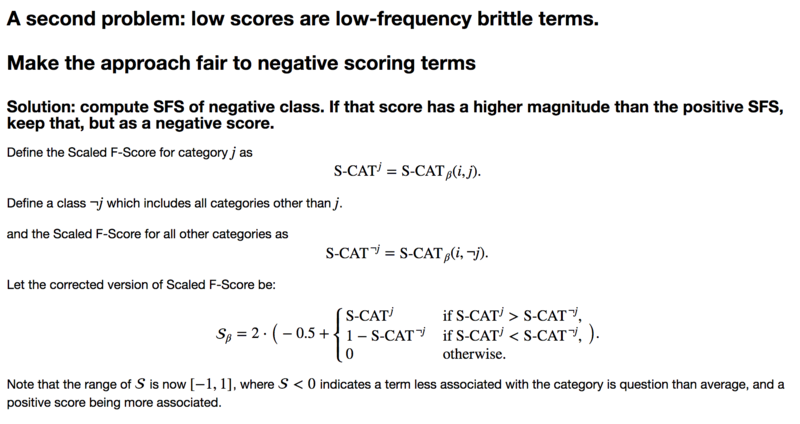 Fixed bug in Scaled F-Score computations, and changed computation to better score words that are inversely correlated to category. word_similarity_explorer_gensim to produce the visualization. See demo_gensim_similarity.py for an example. Added the d3_url and d3_scale_chromatic_url parameters to produce_scattertext_explorer. This provides a way to manually specify the paths to "d3.js" (i.e., the file from "https://cdnjs.cloudflare.com/ajax/libs/d3/4.6.0/d3.min.js") and "d3-scale-chromatic.v1.js" (i.e., the file from "https://d3js.org/d3-scale-chromatic.v1.min.js"). It also lets you use Scattertext if you're serving in an environment with no (or a restricted) external Internet connection. Fixed a bug in 0.0.2.6.0 that transposed default axis labels. Added a Japanese mode to Scattertext. See demo_japanese.py for an example of how to use Japanese. Please run pip install tinysegmenter to parse Japanese. Also, the chiense_mode boolean parameter in produce_scattertext_explorer has been renamed to asian_mode. Custom term positions and axis labels. Although not recommended, you can visualize different metrics on each axis in visualizations similar to Monroe et al. (2008). Please see Custom term positions for more info. Some minor bug fixes, and added a minimum_not_category_term_frequency parameter. This fixes a problem with visualizing imbalanced datasets. It sets a minimum number of times a word that does not appear in the target category must appear before it is displayed. Added TermDocMatrix.remove_entity_tags method to remove entity type tags from the analysis. Fixed matched snippet not displaying issue #9, and fixed a Python 2 issue in created a visualization using a ParsedCorpus prepared via CorpusFromParsedDocuments, mentioned in the latter part of the issue #8 discussion. Again, Python 2 is supported in experimental mode only. Corrected example links on this Readme. Fixed a bug in Issue 8 where the HTML visualization produced by produce_scattertext_html would fail. Fixed a couple issues that rendered Scattertext broken in Python 2. Chinese processing still does not work. Note: Use Python 3.4+ if you can. Fixed links in Readme, and made regex NLP available in CLI. Added the command line tool, and fixed a bug related to Empath visualizations. Ability to see how a particular term is discussed differently between categories through the word_similarity_explorer function. Specialized mode to view sparse term scores. Fixed a bug that was caused by repeated values in background unigram counts. Added true alphabetical term sorting in visualizations. Added an optional save-as-SVG button. Addition option of showing characteristic terms (from the full set of documents) being considered. The option (show_characteristic in produce_scattertext_explorer) is on by default, but currently unavailable for Chinese. If you know of a good Chinese wordcount list, please let me know. The algorithm used to produce these is F-Score. Added document and word count statistics to main visualization. Added preliminary support for visualizing Empath (Fast 2016) topics categories instead of emotions. See the tutorial for more information. Addition of strip_final_period param to FeatsFromSpacyDoc to deal with spaCy tokenization of all-caps documents that can leave periods at the end of terms. I've added support for Chinese, including the ChineseNLP class, which uses a RegExp-based sentence splitter and Jieba for word segmentation. To use it, see the demo_chinese.py file. Note that CorpusFromPandas currently does not support ChineseNLP. In order for the visualization to work, set the asian_mode flag to True in produce_scattertext_explorer. 2012 Convention Data: scraped from The New York Times. count_1w: Peter Norvig assembled this file (downloaded from norvig.com). See http://norvig.com/ngrams/ for an explanation of how it was gathered from a very large corpus. Inspiration for text scatter plots: Rudder, Christian. Dataclysm: Who We Are (When We Think No One's Looking). Random House Incorporated, 2014. Loncaric, Calvin. "Cozy: synthesizing collection data structures." Proceedings of the 2016 24th ACM SIGSOFT International Symposium on Foundations of Software Engineering. ACM, 2016. Fast, Ethan, Binbin Chen, and Michael S. Bernstein. 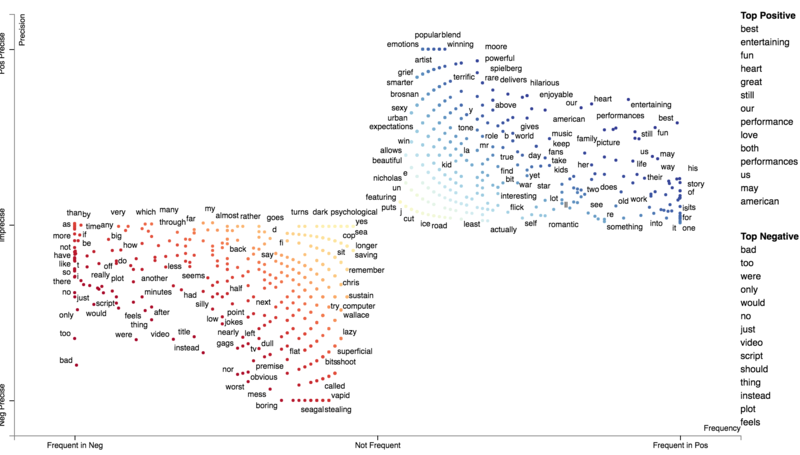 "Empath: Understanding topic signals in large-scale text." Proceedings of the 2016 CHI Conference on Human Factors in Computing Systems. ACM, 2016. Burt L. Monroe, Michael P. Colaresi, and Kevin M. Quinn. 2008. Fightin’ words: Lexical feature selection and evaluation for identifying the content of political conflict. Political Analysis. Bo Pang and Lillian Lee. A Sentimental Education: Sentiment Analysis Using Subjectivity Summarization Based on Minimum Cuts, Proceedings of the ACL, 2004. Abram Handler, Matt Denny, Hanna Wallach, and Brendan O'Connor. Bag of what? Simple noun phrase extraction for corpus analysis. NLP+CSS Workshop at EMNLP 2016. Peter Fankhauser, Jörg Knappen, Elke Teich. Exploring and visualizing variation in language resources. LREC 2014. Shinichi Nakagawa and Innes C. Cuthill. Effect size, confidence interval and statistical significance: a practical guide for biologists. 2007. In Biological Reviews 82.